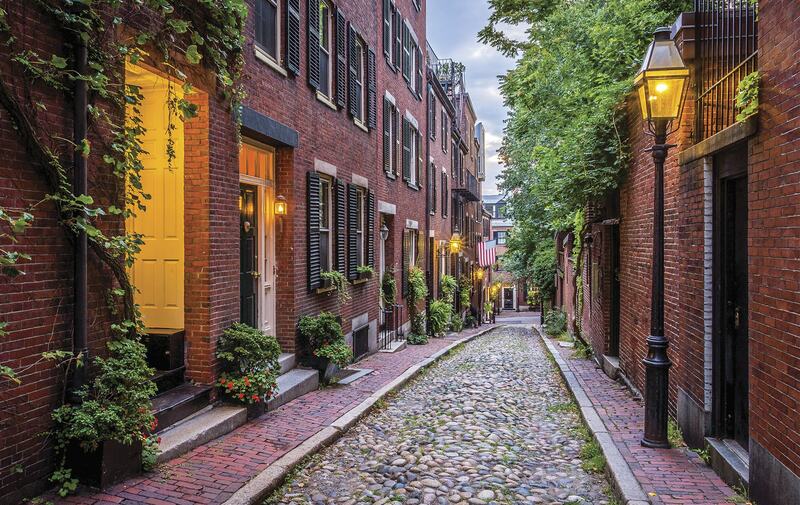 Picturesque Acorn Street, located in the Beacon Hill neighborhood, is one of Boston’s most photographed lanes. This is a short, lean tale, not a “big fat story” about my town. Boston is steeped in history and laid out in steep, winding roads that prove an urban setting can thrive in a non-Euclidean universe. Just try driving or walking in Boston and you’ll see what I mean. Boston also stands as a living testament to the fact that the past is present. When John Winthrop preached his famous “City upon a Hill” sermon aboard the Arbella as the ship bounced across the Atlantic, there was plenty of wine in the hold either to cure or induce seasickness. With all the college kids who now get up to their nocturnal antics, today the good Puritan father would have had to call his sermon “City on the Pill,” but we’re not going there. Nor are we going to digest the libraries full of books that tell readers of all the firsts, all the characters, savory and unsavory, and all the birth pangs that made this special place the Cradle of Liberty, the Athens of America, and, in typical Bostonian self-effacing fashion, the Hub of the Universe. Boston is all about the sameness of change. Its tea party has “gone country,” so there’s a beer party instead. True patriots are drinking Sam Adams instead of thinking very much about this historical figure’s contribution to the Sons of Liberty. Once upon a time, “men went down to the sea in ships” and sent the fruits of the sea and the products of the forest to England and the world. Now the revitalized waterfront is where women and men go down to high finance in suits and light the world with the whale oil of commerce. 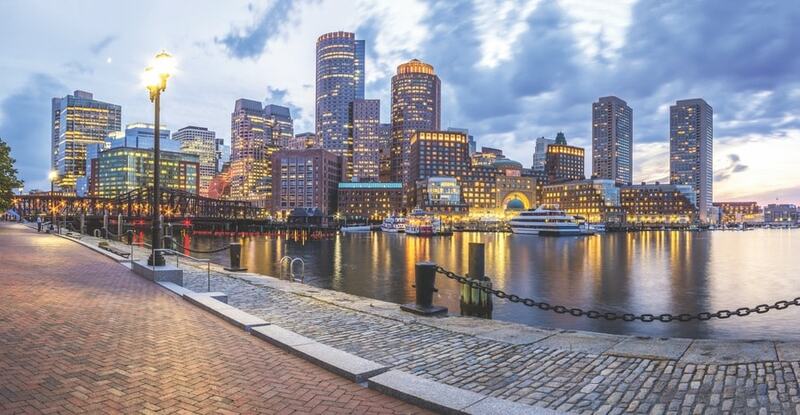 The Boston skyline offers a mix of historic and metropolitan architecture, most beautifully captured when viewed from across Boston Harbor or the Charles River. Trade clam chowder for alphabet soup and what do you get. Thousands of PhDs working at BU, MGH, the BI, BCH, or those additional names that are the difference between life and death: the Brigham and Women’s, Dana-Farber Cancer Institute, Tufts Medical Center, and the like. They’re on the job, with no days off, to cure and find a cure. Like the names of the unmarked streets, everyone knows what those initials mean. They mean that if illness is stalking you, there’s no better place to be. Boston has the oldest subway system in America, if not the world, and there is no truth to the rumor that it smells like it. I, for one, relish the battle that commuters wage daily with public transportation because we are all in it together. We are the face of America. Kids, many of them Asian American, are headed to America’s oldest public school, Boston Latin. The sweet sound of Spanish is being exchanged between dark-eyed ladies who are the backbone of so much retail. Guttural Russian has come to signify those who have found the climate of Boston conducive to freedom and social advancement. The Caribbean smiles, the Middle Eastern dignity, and the complexities of Afro-American sensibility are the new, true blue blood of Boston, and they’re all on the T.
Although Gillette Stadium is outside the city, sports draw a crowd to Boston, especially when the New England Patriots are playing. At the Common or the Esplanade, in Dorchester Heights, on a bench in Roslindale Square, or by Jamaica Pond, you can always strike up a conversation with an old-timer by raising the subject of sports. He’ll tell you about waiting until the end of a game, all but lost to the dreaded Yankees, just to see Ted Williams hit once more. He knows exactly where he was watching as Bobby Orr went airborne after scoring the goal that beat the St. Louis Blues. He’ll talk about how Havlicek stole the ball and forget the words he yelled when the grounder bisected the space between Bill Buckner’s feet or when Mr. Bucky (Bleeping) Dent, the man who was rechristened by Bostonians with a middle name that no parent would give a child, hit that “cheapie” in a play-off game, puncturing the World Series dreams of the beloved Sox. Of course, he’s not thinking of a smelly, four-footed cheese giver, but the diametric opposite: the Greatest of All Time, Tom Brady, to whom Boston and all New England look for pulling the chestnuts of victory from the cauldron of defeat. Then, he’ll say, “These kids today are so spoiled. They don’t know nothing of heartache. Three World Series, a Stanley Cup, an NBA championship, and don’t forget those rings, those five—those one, two, three, four, five, and counting—Super Bowl rings. What do these kids know? They got it easy because they have the goat.” Of course, he’s not thinking of a smelly, four-footed cheese giver, but the diametric opposite: the Greatest of All Time, Tom Brady, to whom Boston and all New England look for pulling the chestnuts of victory from the cauldron of defeat. Don’t get the idea that Boston and Pats faithful limit their admiration for Tom Terrific to his gridiron exploits. TB12 is trying to teach us how to eat and, through Best Buddies International, how to value persons with developmental disabilities. To hear him talk about life with Gisele and his kids is to get a valuable lesson in values. The Massachusetts State House and Boston Public Garden top many to-see lists for those visiting the City on a Hill. Characters—you make a mistake if you think that the home-grown celebrity movie stars of today are the only characters springing out of Boston. I’m not talking about Samuel Gridley Howe, pioneer of educating the blind and first leader of the Perkins School, Horace Mann, Henry Wadsworth Longfellow, Anne Bradstreet, the first woman poet in the British colonies, Frederick Law Olmsted, the designer of Central Park and Boston’s own Emerald Necklace of green. No, I mean characters: Isabella Stewart Gardner, who walked her lion—yes, I said lion—down Huntington Avenue from her Venetian palace to Symphony Hall; James Michael Curley, who had a bridge built near Roxbury Crossing so he could get home from work faster; Arthur Fiedler, who made sure that the Boston Pops would relieve the highbrow of the symphony with music from radio and television commercials, films, and Tin Pan Alley. Why, I haven’t even scratched the surface. Talking about star power, we can look to the city itself. It has starred in so many motion pictures, from The Brink’s Job and The Thomas Crown Affair to The Departed, Black Mass, and Patriots Day. Talking about star power, we can look to the city itself. It has starred in so many motion pictures, from The Brink’s Job and The Thomas Crown Affair to The Departed, Black Mass, and Patriots Day. It’s where Robert B. Parker hired Spenser and Dennis Lehane took us to Mystic River and Shutter Island. Even one of the literary masterpieces of the twenty-first century, David Foster Wallace’s Infinite Jest, is set in Brighton, my own home section of Beantown. As for songs, we don’t have to limit ourselves to the strains of “Dirty Water,” which flows after each Sox victory at Fenway. Freddy Cannon sang “Boston (My Home Town).” Chuck Berry announced to the world that “They’re really rockin’ in Boston.” Bob Seger lit “The Fire Down Below” when he recorded an album, Nine Tonight, at the Boston Garden. The J. Geils Band was scandalized when it found out that its “angel is the centerfold.” The city even gave its name to a band. We danced the Boston Monkey once upon a time. And, we blushed when the Rolling Stones asked, “Well, you heard about the Boston . . .”—almost certainly referring to the notorious Boston Strangler. 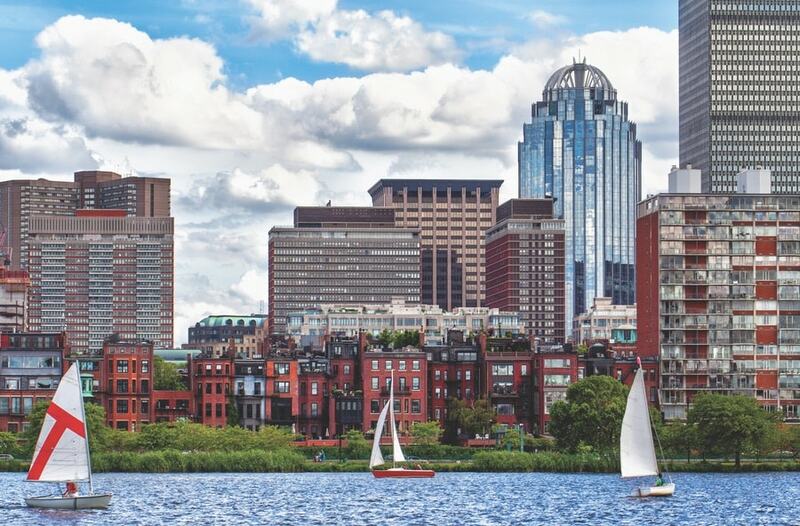 Sailboats cruising along the Charles River with a backdrop of the historic Back Bay neighborhood are reminders of Boston’s rich maritime history. Go for it. Try to put a Bostonian on the defensive by playing the race card or citing other forms of discriminatory behavior. You might not get a history lesson about William Lloyd Garrison, abolitionism, or evasion of the Fugitive Slave Act in the 1850s. Perhaps, you won’t be hit with the contributions of Julia Ward Howe, Rose Standish Nichols, and so many others, vital to the campaign for women’s equality worldwide. You may not be told about how swiftly the Boston schools were reformed in the 1840s to end discrimination against Irish children. Up the ante by dropping how the Sox were the last baseball team to field an African American player and play the horrific images around forced busing to achieve the integration of the public schools. Now, you’re talking. The response will come as fast and hard as a line drive off Carl Yastrzemski’s bat. Check around the league at the time to see how many African American players were on the other squads. Who put the first black coach (the regal Bill Russell) and the first all-black starting five on the basketball court—the Boston Celtics? Who paid dearly for passing on Willie Mays and Jackie Robinson—the Sox, but they weren’t the only ones. Since Reconstruction after the Civil War, what President introduced the most far-reaching piece of civil rights legislation in June of 1963, five months before he was assassinated—John F. Kennedy—and he was from where? The temperature will rise higher than a late spring play-off game at the Garden. Who exposed clerical child abuse? Whose city council best reflects the makeup of the community? Sure, there are stunning differences in income, homeownership, graduation rates, and frequency of incarceration rates in Boston, just like everywhere else in America and the world. But in Boston Massachusetts, we don’t run from problems, we run toward them. Once there was a day—April 15, 2013—when every Bostonian can tell you where she or he was. Once there were pictures that make every citizen of the Hub inform you that she or he knows someone standing close to the finish line. Once, and forever after, there are profiles and sound bites of tragic victims, determined survivors, courageous first responders, and life-saving ordinary citizens. A few days later, after a night of high-speed chases and echoing gunshots, we hunkered down, sheltered in place, and waited. How many terrorists might there be? Could they bomb the subway or some other place of public gathering? Would they ever be killed or caught? How close was this to our 9/11? All right, granted, these were not phrases as eloquent as Lincoln’s second inaugural address, Martin Luther King Jr.’s “I Have a Dream” speech, or George Washington’s Farewell Address. However, they had a transformative power all their own. They conveyed healing where once anger prevailed. They saluted bravery where once bewilderment reigned. They praised a spirit of unity which we all hoped would endure. Oh, we’ve had our share of rogues too. You can see their evidence: in the empty frames where the paintings stood in the Gardner Museum before they were stolen from Boston and all humanity, in the pages of the Herald and the Globe where the ravages of a drug-addicted society are chronicled, on the headstones marking where Whitey Bulger’s and the Strangler’s victims lie, and in the crumbling buildings of UMass Boston that mutely convince us of the corruption written into many state contracts. You can’t hide from these examples, but please come to Boston. Leave your r’s at home. You won’t need them “heah.” Come in the springtime and walk the Freedom Trail with a narrator from Boston By Foot. See the magnolias bloom on Commonwealth Avenue as they mark the end of winter. Ride a swan boat. Kayak on the Charles alongside the blossoming trees. Come in the autumn, when those same trees blaze with the colors of fall. Watch the city turn vibrantly young as the students arrive for another semester. Many of them will remain, convinced that there is no better place to live. Catch the opening tip of the basketball season or the puck dropping for hockey at the Garden. Come in the winter for the Christmas Pops, for the theater season, for rainbows of drama and music at every wavelength. Shelter from the northeast wind at any number of sumptuous breakfast places. Chase away the cold and dark at pubs where everyone will soon know your name. Even if they don’t, you can always get them talking about the Pats, next year’s Sox, or, if you really want to test the edge, politics. 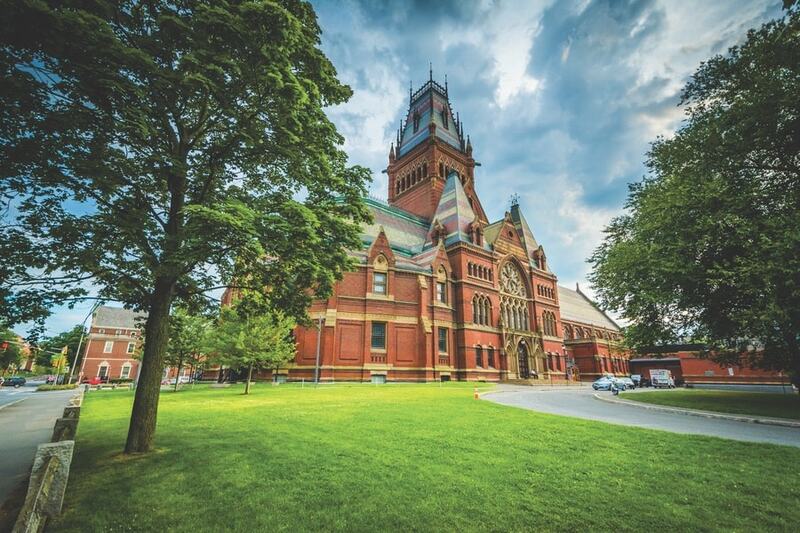 Harvard University’s campus in nearby Cambridge is perfect for a day-trip from the city to experience the school’s architecture, educational programs, and other events. Come in the summer. 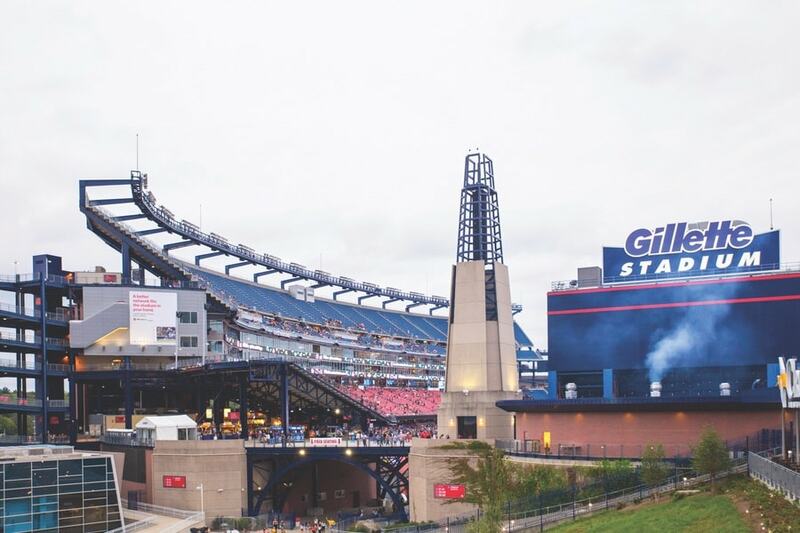 There are free concerts and plays on the banks of that no-longer-dirty water. The harbor islands are beautiful. And the Cape is less than a two-hour drive if you travel on a weekday and avoid rush hour. Come to Boston and learn that the past is neither prologue to the present or even past. This town, masquerading as a city, is as cerebral as Vienna was at the turn of the twentieth century. It’s as energetic and youthful as California. It’s much quieter than New York and, like Paris and London, it’s a city of neighborhoods. You’ll find really “smaht” people and really funny ones too. Some visitors complain that in Boston, people can be as cold as the weather, but they soon realize that Boston friendships last. And this is good old Boston, The home of the bean and the cod, Where the Lowells talk to the Cabots, And the Cabots talk only to God. Instead, we might say: Let’s raise a glass to Boston And to Massachusetts Bay, It’s a city you’ll get lost in Till you decide to stay. A grand statue of George Washington presides over the Boston Public Garden, a reminder of the city’s importance in the Revolutionary War. Will you have to look both ways three times before you cross a street? Will you become convinced that all Boston drivers believe that laws are made for someone else? Will you be driven to the edge of sanity by sports-obsessed talk radio? Will you occasionally weary of telling the kids across the street to turn down the music and pick up the beer bottles? Will you yearn for a conversation in which your antagonist can tell the difference between a fact and an opinion? Will you pray that, for once, the Red Sox will hold on to a lead? Will you tire of some professor or hot new author trying to persuade you that what they’ve written is the latest and greatest imaginable thing? Will you occasionally get a little queasy from the clashing odors of so many different cuisines as you shop? 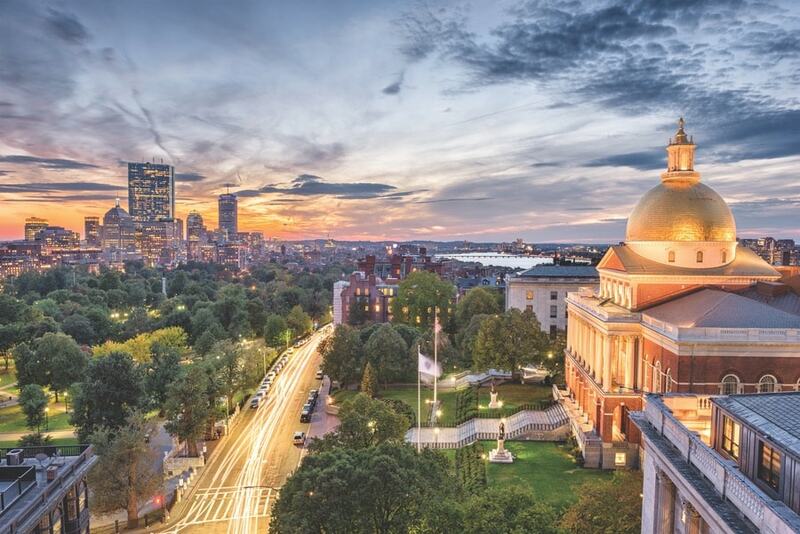 Will you ever get sick of meeting other Bostonians outside of Massachusetts who ask, “Boston, hah, what parish?” Maybe so, but Boston is the home to which Bostonians so fervently wish to return when forced to live elsewhere. It’s the place that is so special that it makes you proud to the border of arrogance. Boston is a dangerous place. Not because of its crazy drivers, not because of its criminal element, and not because of its unbearable and abrupt weather changes. This city is a dangerous place because, after you’ve lived here, you learn to unfavorably compare every other place to the Hub. Now, like a good visitor, try to decide whether the previous sentence is an opinion or a fact. 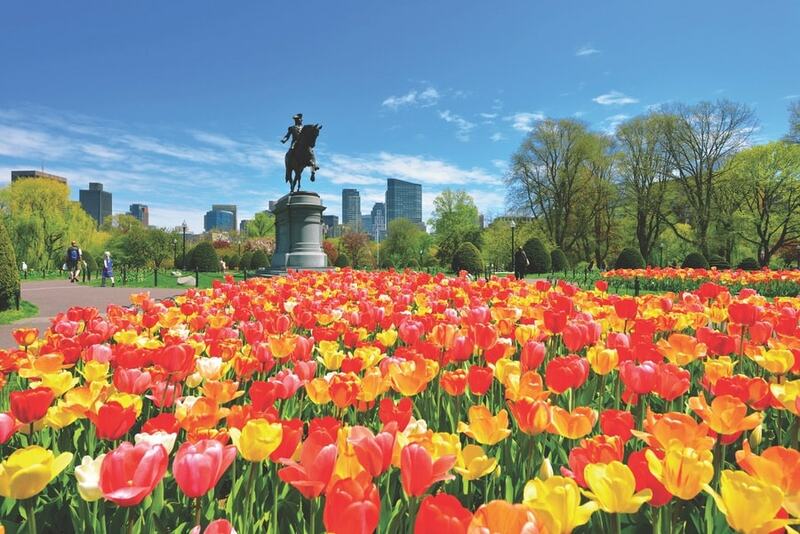 Plan your trip with help from BostonUSA.com. 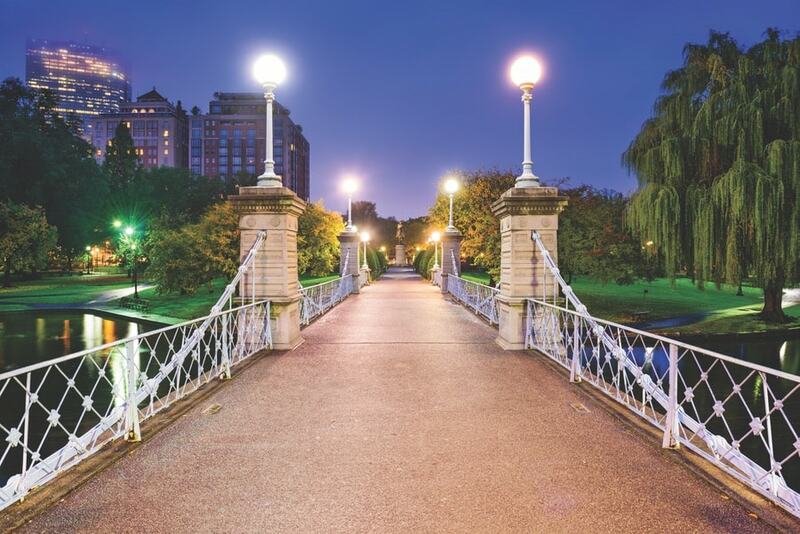 It’s no secret that Boston is or has been home to celebrities from all walks of life. They range from film and television stars to musicians, athletes, socialites, politicians, philanthropists, scholars, and more. The world loves to watch them (and comment on their accents), and the city is proud to embrace their own. Take a gander at some of these Boston natives and alums shining on the red carpet and beyond in our La scène: Boston Edition.